You already saw this picture last month, but I thought it was appropriate since I was all decked out in Rat City gear. Quick post to brag about my big deal derby accomplishments this past week! If you’ve been wondering where the heck I’ve been, well, I realized last night (after two back to back practices, and after watching another league’s bout) that I skated 6 of 7 days last week! I wasn’t consciously trying to do that, but that’s just how it ended up. Part of the reason was that it was really nice and sunny all week, so we went to skate around Green Lake last Sunday, and then Thomas had new wheels to try out, and then I got new skates. What’s that, new skates?! 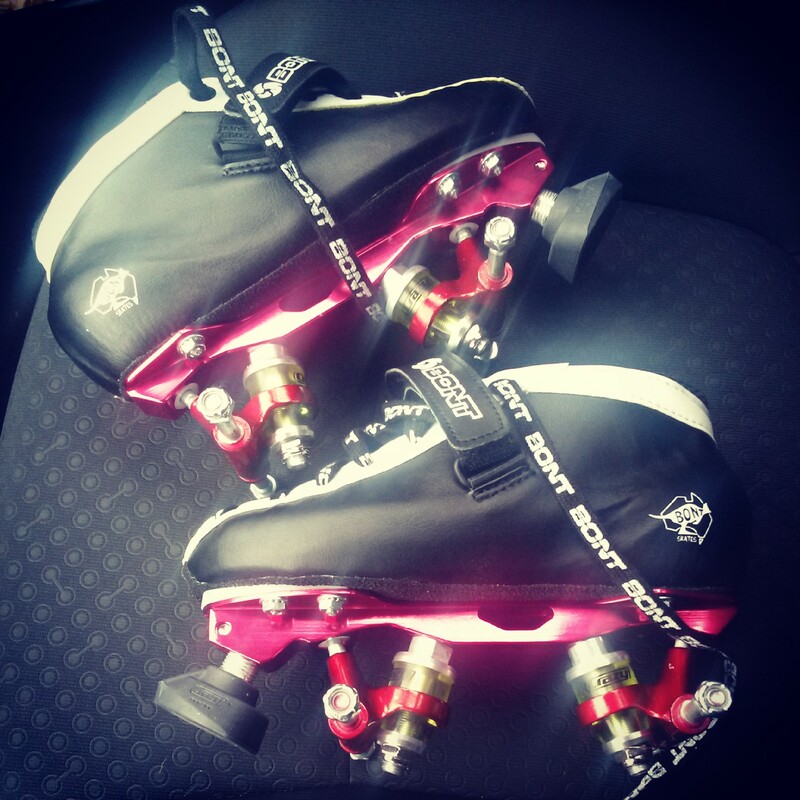 I HAVE AWESOME VEGAN SKATES NOW?! YES, YES I DO! 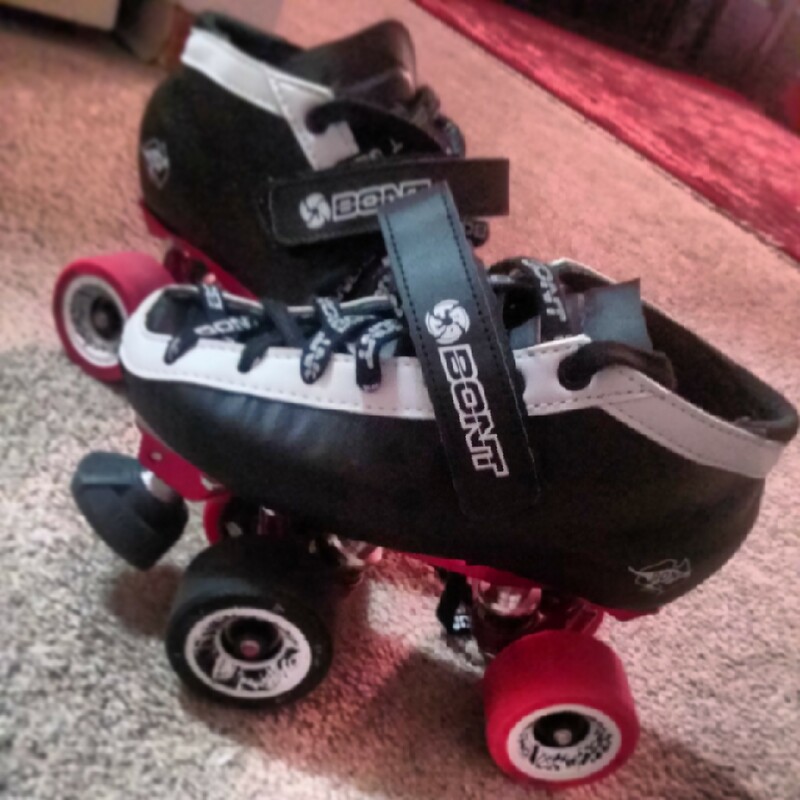 The Bont microfiber boots I ordered during Fast Girl’s annivesary sale came in, and Thursday I was able to get them mounted and molded. Unfortunately, the plates I had on my old skates were too big for the new boots (so I will be selling them, as well as my other skates) but I liked them so much, I bought them again in the right size in a really pretty red. Bont Hybrid in microfiber with Crazy Venus plates and lightweight kingpins. These are incredibly light, and I got to skate in them a little bit yesterday afternoon. I already love them. Just have to finish heat molding the toe box, and get used to the slightly looser truck setting that I have them at right now. I skated for the Rat City Rollergirls assessment yesterday to try to get on Rat Lab Fundamentals. (read all about their multi tier freshmeat program here) After skating with their rec league sporadically, and having a few of the girls I skated with make it on in the last couple of months, I decided to go for it. I tried to remain as calm as possible all week, and not let me talk myself out of it. (It helped that one of my good friends from PFM was going too!) It was a hard practice, but I made it through the entire thing, remained positive, and gave it my all. I got my closest to 27 in 5 yet, just a foot or two short of the whistle! I think I will definitely be getting there on my next attempt, after a plateau of 26.75! And even though I was sure that they’d pass on me this time, when it was all said and done, I received my congratulatory email yesterday as I was getting ready to go watch the Tilted Thunder Rail Bird‘s bout (banked track roller derby). I was in complete shock and overjoyed! 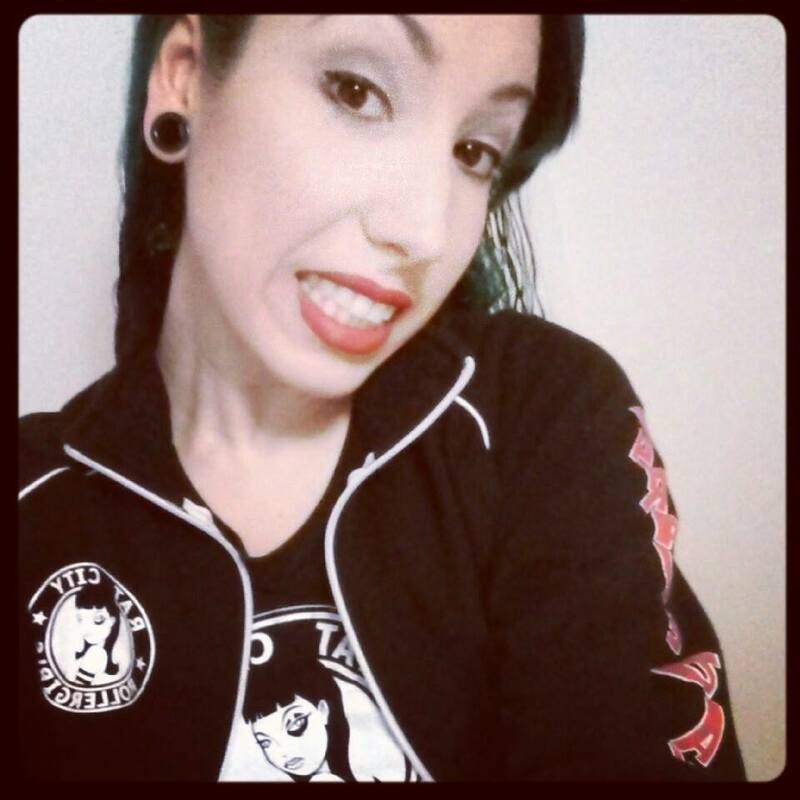 So I will now be officially training with the Division 1 WFTDA ranked #13 team, Rat City Rollergirls!!!!!! SO excited and thankful for the opportunity to take my training and skills up to the next level, just had to share. I would stay and tell you more, but I actually need to get dressed for my regular team practice! 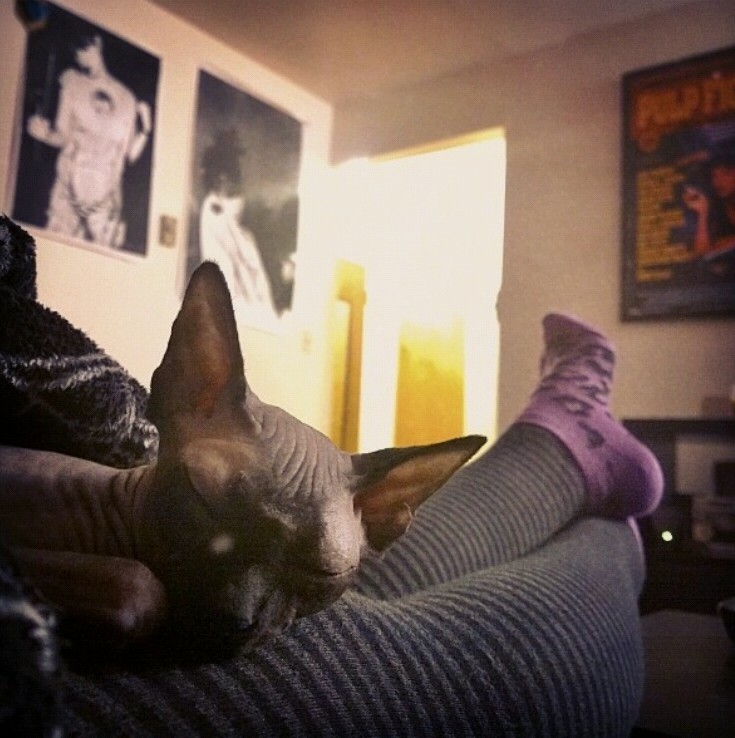 I’m still working on finishing up that post on roller derby and body image, so that should be coming up this week! 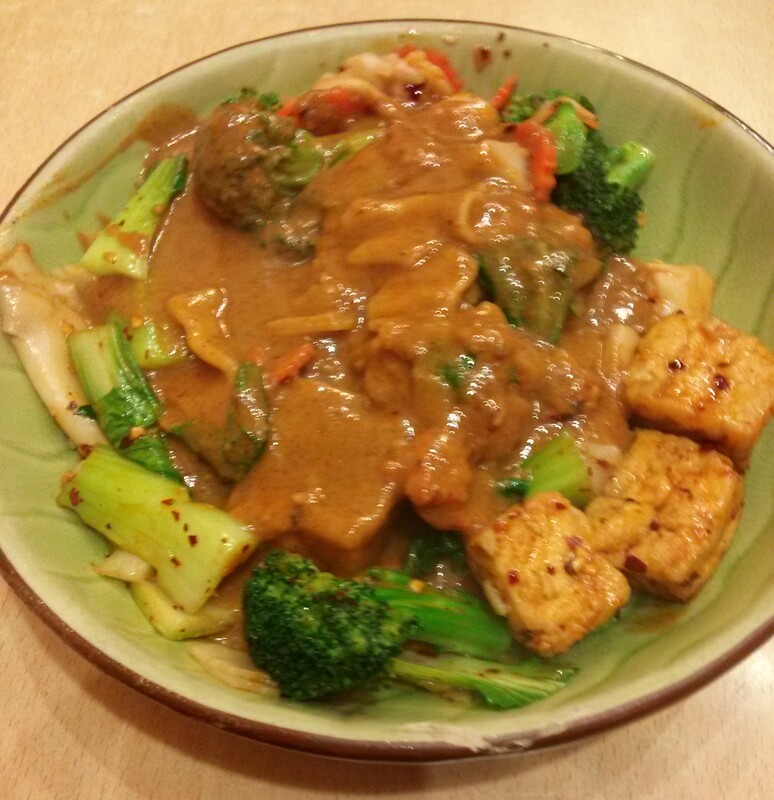 Thai Peanut Sauce with wide noodles and tofu, $10.29. Stir fried with bok choy, broccoli and carrot then topped with peanut sauce. OMG, YUM! 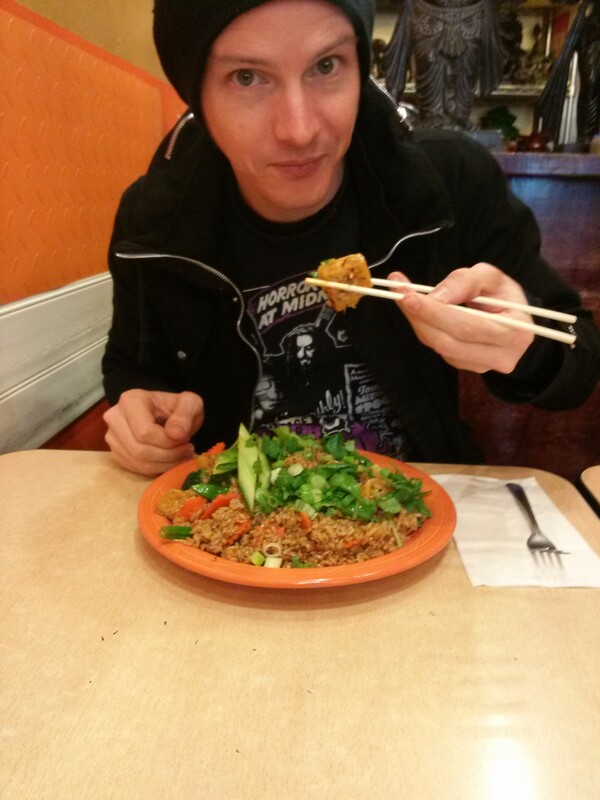 Thomas had Ginger Fried brown rice and tofu, $ 9.99. Stir fried with carrot, green onion, snow pea, celery, broccoli and fresh ginger. ← The triumphant return of Highline: Seattle’s only vegan bar! Hi, so far so good! I have the snap on rubber toe caps and they haven’t scuffed anywhere on the boots beside the very first day I skate in them – because I had forgotten to put on the toe caps!